SMARTY Cologne City Center i Köln, Tyskland : Boka nu! 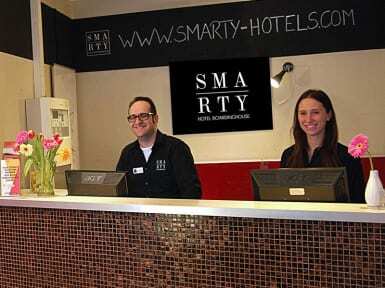 SMARTY Cologne City Center Hotel | Hostel | Boardinghouse offers more than just low-cost accommodation: Free Wi-Fi internet, 24-hour reception & bar and a fully equipped guest kitchen. Whether you are traveling solo or in a group, here you will be able to mingle with people from different places and cultures before you even walk out the doors. SMARTY Cologne City Center Hotel | Hostel | Boardinghouse is located on the left bank of the Rhine river in the cosmopolitan district of Cologne close to the lively nightlife area. It is the ideal starting point for shopping trips at Schildergasse and a quick stroll through the old town to the Cologne Cathedral. The underground stations Zülpicherplatz and Rudolfplatz are in close proximity to the hotel and take you to Cologne Main Station, to Koelnmesse and LanxessArena within only a few minutes. Whether after a night of partying or for the start of an exciting city tour - on the ground floor of SMARTY Cologne City Center you will find SMARTY 24hrs Snack & Coffee Place. Featuring a quick bite as well as hot and cold drinks, the Snack & Coffee Place also offers a small Breakfast2Go from 6.30 hrs onwards daily. Mysigt ställe med väldig bra personal som var glada och hjälpte en hela tiden. Tar ca 30 minuter att gå ner till centrum. Fanns det man behöver ha på ett hostel. Nackdelar var att det inte fanns någon fläkt (var väldigt varmt) och att det var väldigt lyhört till korridoren. Så tips är att inskaffa nya dörrar som är mer ljudisolerade eller verkligen betona reglerna att det ska vara tyst efter kl 22 och se till att reglerna följs.